November 17, 2015 – The first flight of Orbital ATK’s enhanced Cygnus spacecraft will carry more than 7,000 pounds of equipment and experiments to the International Space Station on a mission that marks the resumption of NASA’s commercial resupply efforts. 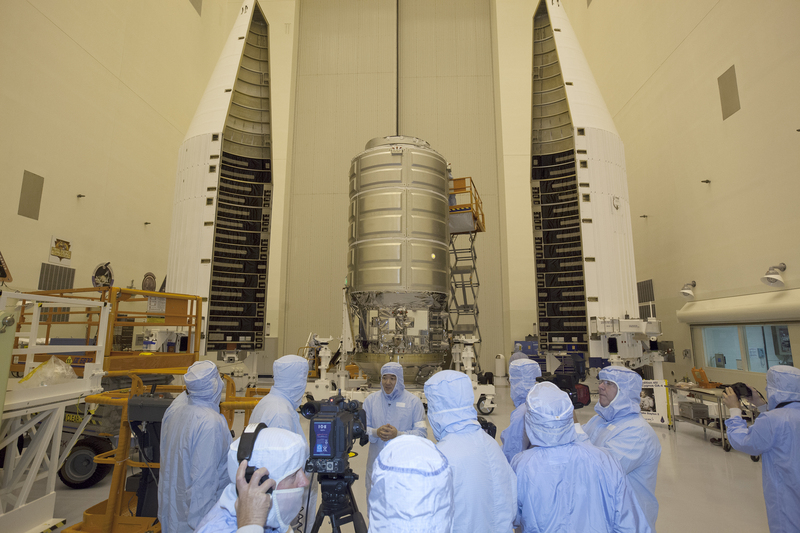 Standing inside the Payload Hazardous Servicing Facility at Kennedy Space Center in Florida, the 20.5-foot-tall, cylindrical Cygnus has been loaded for flight and will soon be bolted inside a protective fairing for its targeted launch date of December 3. “This is an exciting time; the Cygnus launch will resume regular U.S.-based cargo missions to the station,” said Randy Gordon, Launch Support Project manager for NASA. The enhanced Cygnus can carry about 25 percent more mass than its predecessor and features upgraded Ultraflex solar arrays that unfurl like a fan into a circle and are lighter than the previous models. For NASA, the increased capacity brings the obvious benefit of taking more to the station at once, ranging from daily supplies of food and clothing to new experiments for the ISS residents. Science payloads include a new life science facility that will support studies on cell cultures, bacteria, and other micro-organisms; a microsatellite deployer and the first microsatellite to be deployed from the space station; experiments that will study the behavior of gases and liquids and clarify the thermo-physical properties of molten steel; and evaluations of flame-resistant textiles. The University of Colorado’s Laboratory for Atmospheric and Space Physics (LASP) designed and developed the Miniature X-Ray Solar Spectrometer (MinXSS), a 3U CubeSat that will be deployed from the International Space Station. All standard satellite subsystems are present in MinXSS, except propulsion, and the entire unit is roughly the size of a loaf of bread. Many of the subsystems were custom-developed by CU and LASP, leveraging heritage from the highly successful Colorado Student Space Weather Experiment (CSSWE) CubeSat. MinXSS will collect data to help scientists better understand the energy distribution of solar flare soft X-ray emissions and the impact of space weather activity. This activity can impact telecommunications and navigation systems and in a worst-case scenario, can disrupt the power grid for months, or even years. This launch also marks the first use of the workhorse Atlas V rocket from Centennial-based United Launch Alliance (ULA) to lift a payload to the space station. “Atlas V has put satellites in orbit reliably and we are thrilled to be partners both with ULA on the Atlas and with NASA to fly Cygnus to deliver this important cargo to the space station,” said Dan Tani, a former astronaut who is now Orbital ATK’s vice president for Mission and Cargo Operations. Cygnus will use autonomous systems and be guided by ground controllers to maneuver carefully near the space station until it is close enough for station astronaut Kjell Lindgren to grasp it with the station’s robotic arm. Cygnus will then be moved into place and latched to the station for unloading. It will remain docked at the station for about three weeks. Orbital ATK named the ship S.S. Deke Slayton II in tribute to the Mercury 7 astronaut who became a leader in commercial spaceflight. The cargo includes numerous experiments across an array of specialties along with some student-devised projects. The laboratory facilities of the station have been vital in studying the effects on astronauts of long-duration spaceflight akin to the impacts crews might experience during future deep space missions and an eventual journey to Mars. Station commander Scott Kelly – who is more than 225 days into his yearlong residency in space – continues to take part in many of the experiments and observations so researchers can develop ways to counter effect conditions such as bone-loss that astronauts experience during long stays in weightless conditions. Crew supplies including food, water and clothing also will be unpacked and stowed. The residents count on deliveries from an assortment of international cargo spacecraft to keep the station’s pantry and closets full. Station residents will load the empty spacecraft with equipment and unneeded items before it is released to burn up in the atmosphere.